← Weird Western Thriller – “A Coffin Full Of Stars”! We soon entered the bustling streets of the second block of Aioicho, in the Honjo district, and looked out cautiously upon the soiled, transient beauty of the Low City, built on marshy land claimed from the tides, crisscrossed by canals and bridges. The carriage rode slowly through crowded rows of narrow thin-walled houses with shingle roofs, and open-front stores with merchants shouting their wares in hoarse, cracked voices. We passed shops selling all manner of dried fish and seaweed, along with household goods stores, lamp oil sellers, cut-leaf tobacco dealers, tabi sock makers and pawnbrokers. We were all taken aback when Shichi ordered the driver of the carriage to halt. “Are you sure that’s wise?” said Hideaki. “They could be waiting for us on the way to Hokusai’s residence,” pointed out Tomoe. “They could have laid a trap,” I said. We left the carriage, with the six of us wrapped in priest’s robes carrying sticks and tiny hand-bells. The straw hats came down almost to our shoulders, looking like the pots that fishermen used to catch lobsters in Edo Bay. The dust and fibers flaking off the wicker hat caught at my nose, and I tried my best not to sneeze. The carriage rattled back the way it came, and we ventured through the streets in single file, our heads bowed, Shichi at the front intoning the Lotus Sutra in a loud baritone and ringing his bell at regular intervals. The streets were filled with men and women in kimonos and geta sandals passing us on foot, sparing us not a glance. Street vendors carrying baskets of dried fish and pickles walked by, their shouts irritating the ears. Sparrows twittered in the branches of the willow and cherry trees lining the dirt road. Pink and white blossoms fluttered in the air around us, laying a gossamer carpet at our feet. “You’ll die near here as well if we don’t keep moving,” I heard Hideaki mutter, as he nudged Hokusai forward. As we approached Ryogoku bridge, we noticed more and more tall buildings with two or three stories, blocking the sunlight. These were the shanty residences of the day laborers, and their walls consisted of garishly colored wrapping paper. Wood was still in short supply because of the Shogunate’s constant demand for construction materials, so the laborers had taken to using heavy paper wrapping from sake barrels as makeshift walls. Such paper – like the sake it used to contain – was always in abundance. This area had been ravaged by fire many years ago. Flames devoured the bridges and trapped hundreds of Low City dwellers between the canals. Half a year ago, we had been employed by Magistrate Kotani to exorcise the anguished yurei spirits of those burned to death in the fire. The memory still haunted me on nights when the wind howled mournfully through the willow trees. The row of wooden hovels came to an end, and we turned a corner into the wide public square in front of Ryogoku Bridge. The square divided the city itself from riverbanks worn smooth by constant foot traffic and the loading of boats, and was filled with a constant air of carnival. It was an owner-less space, grudgingly acknowledged by the Shogunate as belonging to the common folk of Edo. It was thronged with rickety stalls selling cheap food and sake. Fortune-tellers, musicians, and acrobats displayed their talents, adding to the general cacophony. Behind the stalls and at the entrance to the alleyways, tea houses and shops of a more permanent nature plied their wares, selling indigo cotton for kimonos, wooden bowls, cutting tools of every size and shape, straw sandals, morning glory flowers. The hawkers yelled from every shop doorway, their voices raw with the day’s efforts. Between the margin of the water and the steps onto the bridge a tiny shrine to Inari, fox-god of the harvest, lay hidden in the shade. Wild cats skulked behind it, bolting across the thoroughfare any time someone walked too close. At the edge of the square lay the mighty Sumida river, the artery carrying the life-blood of all Edo, stretching away to north and south. The water gleamed in the sunlight, and fallen petals formed a pale skin upon its surface. The river was thronged with yakatabune – pleasure boats owned by the local inns, and hired by townsfolk determined to enjoy the spring cherry-blossom parties. Some of the boats in the center of the river were gorgeous affairs, decorated with gold and silver and painted with urushi lacquer. These belonged to the noble samurai families. The vast majority of boats, however, were plain wooden vessels carrying merchants, lower-rank samurai, and girls hired from the nearby Yoshiwara. The larger ones had wooden roofs where half-naked ferrymen sat, thrusting long oars into the river and rowing with their bare, muscled arms. “Yosh-oi! Yosh-oi!” they shouted rhythmically. Her voice was full-throated and filled with genuine happiness, which perversely inspired a profound sadness within me. Why did my life have to be lived in secret? Why did I spend my days in the shunned, shadowed corners of the world, dealing with threats on the border between light and darkness, life and death? Why could I not enjoy the simple pleasures of a fine meal, the laughter of a new friend, or the sun on my face? But I also knew it was pointless to ask these things. My life had one purpose; to serve the Shogunate. The meaning of my life was found in performing that task to the best of my ability, such as following the arrogant samurai Shichi in front of me. As he had said, it was all decided. Shichi led us into the square and toward the steps to the bridge. Looking around cautiously, I noticed a group of men wearing hats similar to ours, straw creations that covered the whole head. They wore dark robes and held up large, flimsy sheets of paper, relating the paper’s contents in lilting, rhythmical voices. Those sheets were kawara-ban – newspapers printed on tile block. The vendors hid their faces because many of the articles within were scurrilous pieces critical of the Shogunate. “They’re talking about me!” I heard Hokusai mutter. “How much?” I heard Hokusai gasp. He halted mid-stride, and turned toward the vendors. Instantly, the three vendors dropped their newspapers, their straw-pot heads swiveling in our direction. “Old man, you are too stupid to live,” I heard Shichi say, with a whispered curse. Screams of shock went through the crowd as the goods in front of a kimono-dealer’s shop were suddenly tipped over. A long streak of indigo shot through the air toward us. I barely had time to recognize it as a stretch of kimono fabric that had unrolled itself and was skimming above the ground like a manta ray. Shichi leaped at Hokusai and pushed him to the ground. The bolt of fabric struck the place where Hokusai had been standing – and wrapped itself with incredible speed around Shichi’s body. It lifted him into the air and then the roll of kimono floated higher, to the rooftops and over them, turning west. Bulges and ripples appeared in the roll of fabric, and I heard muffled cries, growing fainter and fainter. All of this occurred in the space of a few seconds. We had witnessed the attack of the Ittan-momen – a Yokai that took the form of a living, flying sheet of cloth. It must have had very simple instructions – to snare its prey then carry it to a designated location. The Ittan-momen, however, was not intelligent enough to realize it had the wrong prey. For an instant, a deadly hush hung over the square, as the townsfolk froze in their actions. Then it was utter chaos as frightened people ran in every direction. The three vendors who had baited the trap took off their robes and straw hats. They wore finely made samurai clothes and carried two swords; but their heads had the snouts and feral eyes of animals. Long needles of hair swept back from their brows, which had one long horn sprouting from the center. They were Shohnoban – warrior Yokai well-known to the Star-Teller’s Academy for their love of warfare and violence; but what were they doing in Edo, so far from their home territory? All four of us hastily threw off our robes and straw hats, brandishing swords and naginatas, forming a tight line between the Shohnoban and Hokusai. Before we could engage our battle plan, another commotion at the kimono shop drew our attention. Most of the commoners had fled the square, but two women in kimonos remained. They turned slowly toward us. One of them had a face completely obscured by long, bedraggled hair that moved and rippled with a sinuous, snakelike movement, as if it were alive. The other woman seemed human enough; but then her head rose upward as her neck extended like a stalk, telescoping higher and higher, bending and coiling like a python, giving her such a vantage point she could track our every move from above. From the tobacco dealer’s next to the kimono store, a great cloud of undulating, hazy smoke drifted out of the window. At first I thought the store was on fire, but there were no flames, and the smoke quickly coalesced into the vague grey shape of an armed warrior. From the store on the other side, a waxen umbrella hopped over the ground on a thin sticklike leg, and a red paper lantern unhooked itself from the door and floated outward. Both of them had holes ripped in the paper that gaped like eyes and mouths; long red tongues lolled obscenely out of them as they advanced. Despite my heart telling me to stay, I knew there was no time to argue. Shunsuke and I grabbed Hokusai by one arm each and started to run. It is not easy to run while pulling and dragging an old man with you; our lack of speed would have to be matched by some outrageous luck. I threw a glance over my shoulder as I left. Hideaki had raised both arms to the sky, ready to release a powerful blast of Ki energy. Tomoe had O-fuda in both hands and had begun to pirouette, performing the Spiral of the Flying Dragon. We reached the bridge and ran onto it, our sandals thumping on the wooden planks. A lone male figure stood near the railings, but as he turned, my heart sunk to see it was another Shohnoban warrior. “Now what do we do?” said Hokusai. “We overpower him,” I said. “It is the sort of thing we do every day before breakfast,” Shunsuke gasped. We skidded to a halt. The Shohnoban stood watching us slyly, and made no move to unsheathe his swords. I decided to attempt diplomacy; we had nothing to lose. He lifted one hair-covered claw sharply, the talons stretched in a cryptic gesture. To our left, the air began to swirl and throb, growing darker as if a tiny storm was taking shape. I realized that he had summoned a Black Wall – a portal that let things through from other times, other places. “Give your speeches to the Nurikabe,” he gloated. From the murky portal, a giant white slab of stone materialized and smashed down onto the bridge. The shock was too much for the structure, and the planks underneath it snapped and shot upward. The bridge trembled and swayed. Hokusai, Shunsuke and I froze in place, fearing that a single step might cause the floor to give way. Another Black Wall was forming to our right, a churning black flurry in the air. There was no time to think; munin mushin. No thoughts, no mind, as the Zen poets wrote. The breath rushed out of my body as I fell onto the grid of wooden timbers supporting the underside of the bridge. For a moment I did not move. I was afraid I had broken something – my legs, my arms, maybe my neck. I opened my eyes. Shunsuke and Hokusai were lying next to me, twisting around, peering down into the river below us. “Shall we jump?” asked Shunsuke. “Then we shall pull your unconscious body behind us,” said Shunsuke through gritted teeth. We hurriedly squeezed ourselves through the square holes in the timber grid, and lowered ourselves down until we were hanging by our arms, our feet dangling above the water. The boats nearby had noticed, and pointed at us in alarm. Within a few seconds, a large blossom-viewing boat glided underneath us, a vessel with a tall canopy and red paper lanterns decorating the sides. “Jump!” cried Shunsuke, and we let go of the timbers, dropping onto the wooden platform beneath. Thanks to my training, the Ki relaxed me and cushioned the impact so I landed in a crouch, but still on my feet. Shunsuke also recovered quickly, but Hokusai collapsed to the deck, crying out in pain. “Is he hurt?” I called. Shouts of alarm and commotion were coming from the boat under the platform; it seemed we had interrupted someone’s party. I lay on the platform, putting my head and shoulders over the side to greet the occupants upside-down. The boat’s interior sheltered a group of four men and four women, who hurriedly covered a number of cups and pots under their kimonos; it was forbidden, in Edo, to drink alcohol out in the open air. The women had been playing koto and shamisen, and they clutched their instruments defensively as they stared at me in shock. I was considering how to answer when one of the women gave a deafening scream of fear. The shamisen pulled itself out of her grasp, its strings snapping away and waving rapidly in the air like grasping tentacles. The koto also moved of its own accord, the strings unraveling themselves. The nearest red lantern split across the middle, and a long, slimy tongue lolled downward. Two hateful eyes burned holes in the paper. “I have an idea,” said Shunsuke. He pointed across the river. Next to our boat, another yakatabune was slowly passing, almost close enough to touch. Beyond out stood another, and another – today was such a glorious day at the height of the cherry blossom season that an almost unbroken line of boats stretched away, to the opposite bank of the Sumida. “You cannot be serious,” I said to him. “I do not see we have a great deal of choice,” he replied. “What? What madness are you planning now?” Hokusai demanded. We grabbed the protesting Hokusai by one arm each, Shunsuke on his left and I on the right, and we jumped. Our sandals thumped down hard on the canopy of the nearby boat and we broke into a run, stepping to the canopy edge and jumping again. Our momentum carried us from boat to boat, the canopies rocking and bobbing in the water under our weight. My legs began to ache from the effort of launching myself into the air and keeping my balance, while lifting Hokusai off his feet and pulling him with us. Shouts of anger and shock grew louder around us, and the nearby ferrymen stopped rowing to point and stare. Their faces, the red lanterns on the prows, and the whirling cherry blossom in the air, passed by me in a blur. At length, we landed on a boat that had no nearby companion beyond it. The nearest boat was physically too far to jump. “What now?” I cried. He ran to the prow of the ship, where a long vertical pole carried a number of red lanterns hung in gay decoration. He gripped the pole and began to climb up the rungs and struts it was covered with. I pushed Hokusai forward, climbing with him, gripping the handholds and his kimono at the same time. 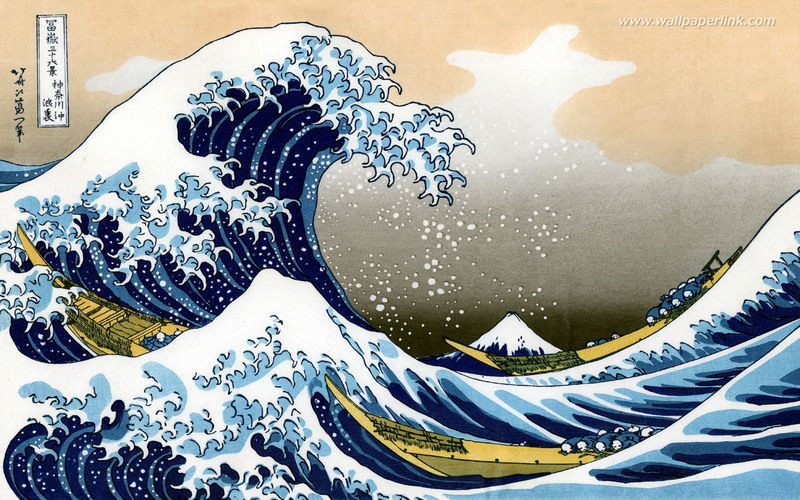 Hokusai’s face was white, and his eyes kept rolling back in his head; he was on the verge of fainting. Around me, a sibilant hissing came from the red lanterns. The paper crackled and ripped, forming eyes and mouths, smoke licking out of the holes. Shunsuke had reached the top of the pole. It began to tip under his weight, and cries of panic came from below as we began to capsize. The pole tilted lower and lower to the right, carrying us down, to a number of boats further along the river. We jumped, pulling Hokusai with us, and sprawled onto another wooden platform. This time I couldn’t keep my balance and landed on my back, grunting in pain. Shunsuke and Hokusai were also lying upon the rough wooden surface. Behind us, the boat we had left righted itself, the men and women inside screaming in panic. “This is another nightmare,” Hokusai said. “And we haven’t woken up yet,” Shunsuke said, pointing upriver. The Shohnoban warrior from the bridge had followed us. He was using our method of escape, his powerful legs carrying him effortlessly from boat to boat, his sword brandished, his bloodthirsty eyes glittering in the sunshine. “Do we run?” I asked. “We stand and fight,” said Shunsuke, releasing his sword. With one mighty leap, the Shohnoban landed on the tiny platform with us. “Give me the artist!” he commanded. In answer, Shunsuke lashed out with such speed and fury that the creature had no time to move. Steel whipped across his upper chest and he snarled in pain and surprise. He pounced, and I had my naginata in my arms ready to counter his blow, but the impact sent all four of us crashing to the wood of the canopy. The Shohnoban gripped Shunsuke’s arms with his claws and they grappled, dangerously close to tipping over the edge into the river. The Shohnoban pulled away, getting to his knees and raising his sword for a strike. The tip of the blade glinted as Shunsuke rolled toward me, to avoid the plunging sword. He crawled away, and the Shohnoban rose to his feet. Shouts and cries were rising from the boat beneath us but I was too busy fighting to remain alive to ponder the matter. I hooked the Shohnoban’s wrist with my naginata, bending it back, trying to get it to drop the blade. Suddenly a samurai sword thrust upward through the roof, missing Shunsuke’s foot by inches. It seemed the occupants of the boat were showing their displeasure at having their party interrupted. I released my grip on the Shohnoban’s wrist, and whirled the naginata around to strike him in the chest. He fell backwards, toppling onto the tip of the blade. The Shohnoban gave an unearthly cry, his jaws wide, his head jerking back. The life left his eyes and his body swiftly disintegrated in the manner of Yokai, turning swiftly to ash, leaving no bone or flesh behind. Shunsuke clapped me on the shoulder, but there was no time to waste breath on congratulations. Another yakatabune was passing by, one much larger than the others seen so far. We gripped Hokusai’s arms, braced ourselves, and leaped across the water. This time, we were able to stay on out feet, but we were not alone. A number of oarsmen stood and sat on the platform, and their leader, a red-faced brute covered in tattoos and with a white towel wrapped around his bald head, waved his arms at us threateningly. A mighty splash made us all turn to stare over the deck at the waters below. The waters of the Sumida were boiling, bubbling, frothing, as a dark shape under the water grew larger and larger. Three long thin spikes broke the surface and climbed into the air, unfurling tattered strips of black cloth as they came. The hull and prow of a boat surged upward with a great rending and grinding of wood and metal, to float and bob on the river – but this was no human boat. This was a wreck, made of splintered wood stained and rotted by years of lying at the bottom of the Sumida, its sails blackened by river filth. Skeletons held on to the masts and railings, clinging with bony fingers, eyes black holes in their skulls, jaws gaping open in nightmarish grins. It was a Funa-yurei – a Yokai attack ship. Our commandeered transport sailed onward with an increased burst of speed. I looked around in desperation; a group of watchmen hailed us as they ran across Ryogoku Bridge from the Mukoujima side. I looked back from whence we had come; two tiny figures waved at us from the landing site. Hideaki and Tomoe. They had prevailed against their Yokai attackers; our fate, however, looked grim. Our boat cut through the waters and passed underneath the bridge, almost ramming a number of smaller of pleasure boats as their crews frantically rowed out of the way. The Funa-yurei, however, did not seem to be troubled by any mortal hindrance. One boat failed to get out of its way in time, and the ghost ship sailed right through the prow, its hull slipping through the wood as if it had no physical substance whatsoever. The traumatized revelers inside the yakatabune jumped into the river, screaming in terror, their kimonos billowing up and showing their fundoshi to all the world. The Funa-yurei kept on an even keel, heading straight for us. I tried to remain calm. The oarsmen were doing the best they could, but our boat was impeded by the heavy traffic on the river. As the Yokai approached, one of the rattling assemblages of bone that crewed the ship pushed a cannon onto the deck, which boomed out a spurting flash of green smoke. A ball of fire shot through the air, missing us but passing so close I could feel its unearthly heat. It struck the waters of the Sumida and instantly a wall of ghostly green fire washed upward; kitsunebi. … but then I saw the white sails of the boats moored to the quay on the approaching riverbank. Sails with a diamond crest; they were Higaki cargo boats. The decks were piled high with hempen sacks carrying the Tokugawa seal, and the unmistakable ink symbol of the distant fields of Gyotoku. He relayed the order to his crew, and I swiftly told my plan to Shunsuke, whose face brightened in comprehension. “May the Kamisama guide my hand,” he said in grim determination. Hokusai was sitting upon the deck, breathing heavily. The Funa-yurei was only yards behind our boat. Bony jaws clacked open and shut in anticipation. Our ship drew up alongside the moored vessel and passed it. The crew had abandoned ship and ran across the gangplank into the streets at the sight of the Funa-yurei, which followed in our wake, sailing close to the cargo ship’s hull and the sacks piled upon the deck. Shunsuke stretched out his left arm toward the cargo ship, his eyes closed and his brow furrowed in concentration. The entire pile of sacks shifted, bulged, and then ripped along the seams, spewing their contents out into the air in a pure white spray. The Gyotoku salt fields near Naritasan Shinjoji Temple were a resource under Tokugawa protection; daily shipments were brought along the Sumida to Edo Castle, and also to the merchants of the Low City. Salt was a substance essential to life, and the smooth functioning of the great machine that was the Shogunate. It was also a substance deadly to the Yokai. The white cloud engulfed the Funa-yurei, and when it emerged, we saw that its hull was now blistering and hissing with fumes as if acid had been tipped upon it. It had been a wreck to begin with, and now the salt completed the work of dissolution. The skeletons fell apart into scattered, blackened bones and skulls rolling across the deck. The smoldering wooden shell of the boat began to sink once more into the river, dissolving before our eyes, until it was no more than a collection of planks floating upon the water, flotsam that finally melted and merged into the fallen cherry blossom petals upon the river surface. 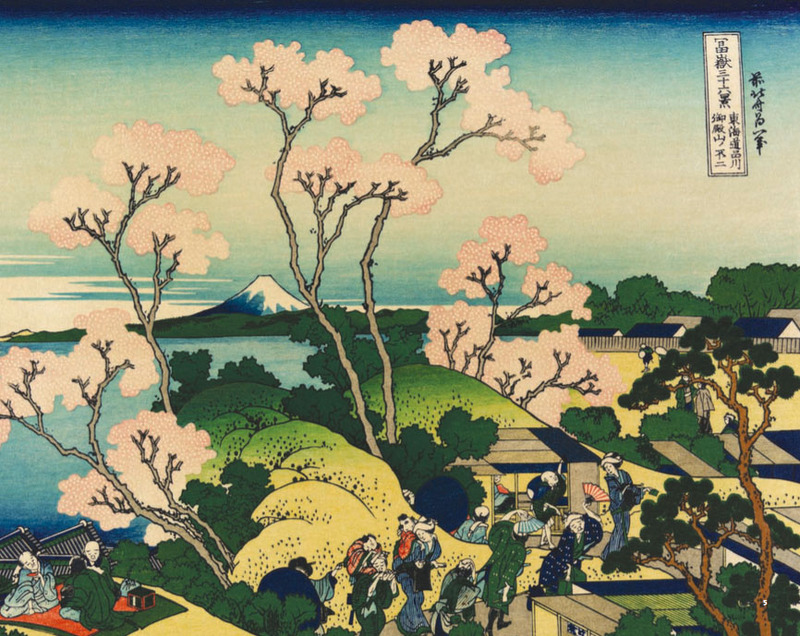 “I shall never paint cherry blossom again,” Hokusai declared, then lay down on the deck and began to weep. Once, in the ancient days of Edo, there stood a small teahouse in the pleasure quarters of Yoshiwara. It was located on the Gojikken-michi leading to the local shrine, at an unassuming spot opposite the Traveler’s Well. It did not have a high reputation; the painted exterior was chipped and peeling, the demeanor of the mistress and her courtesans was not very welcoming, and the quality of their sashimi and sake was not highly recommended. It was shunned by most of the pleasure-seeking Edo revelers, who knew they could have a much more carefree time in the other teahouses. On that certain evening in Spring, the mistress carefully closed the sliding wooden doors to the rear chamber, and stood at the porch smoking her pipe and glaring at the merchants and lower-rank samurai passing by, drunkenly trying to catch the falling cherry blossoms as they fell. Behind those sliding doors, in one of the secret meeting places of the Nine Star Division, the man we knew under the name of Mitsu drew himself up to his full height, and glared at each of us in turn. My three companions and I knelt in seiza position on the tatami, our heads respectfully bowed. Hokusai Katsushika sat cross-legged, his eyes bright, his back straight, now recovered from his ordeal at Ryogokubashi and thoroughly enjoying the attention of such a secret and powerful branch of the Shogunate. “It was thanks to your diligent training,” I said in return. He frowned and turned his beady eyes on Shunsuke and Hideaki. We cast our eyes downward in momentary reflection, but I could see that Hideaki was still concealing a smirk. “It is not a question of how you can prepare for it,” said a female voice behind us. It was not in the nature of the Star-Tellers Academy to be taken by surprise. Tomoe, with her growing skills of prescience, had intuited that we might receive a visit this day from our Yamataikoku mentor. “Greetings, Willow in the Storm,” said Mitsu, smiling broadly. Chiyoko strode from the shadows of the teahouse chamber into the center of the room. “Have you used that wondrous Onmyodo engineering to visit us from a future time?” asked Mitsui. “I have,” Chiyoko said grimly. “Yes,” said Hokusai, beginning to weep quietly with joy. “Not with Onmyodo, but with the sorcery of art, I shall create a picture that will last through the ages, and its power shall reach out through the wood and the paper to the world beyond. It will be cherished and protected by all who gaze upon it, until it reaches its intended audience: Reiko Furukawa Bergman, and her companions. Reiko Furukawa Bergman. I shivered when I heard the name. My own name … so familiar … yet so strange. She turned to look at each one of us in turn, inspecting our faces with an intensity that I had never seen before – and Chiyoko was the most intense person I had encountered in my short life. Chiyoko’s face darkened with emotion. “Will this make it less easy for the enemy to sense his presence?” asked Shunsuke. “Less easy, I think, but not impossible,” answered Tomoe. “For the rest of our lives?” I asked. Chiyoko gave a silent acknowledgment with her eyes that the implication was understood. “So we spend the rest of our lives with each other,” said Shunsuke, looking directly at me. “And with a grumpy old man,” said Hideaki. “So that a future world can be saved,” said Tomoe. We all stared at each other. I looked at Shunsuke and met his gaze. “So be it,” I said. GO HERE TO FIND OUT MORE ABOUT THE EXPLOSIVE YA FANTASY TRILOGY, “SWORD, MIRROR, JEWEL”! EXCALIBUR … THE CUTTING EDGE OF NEW FICTION! This entry was posted in Japan, Literature, Mythology. Bookmark the permalink.